Before I became an esthetician I had come across a common form of seborrheic dermatitis which is cradle cap. My son had had severe cradle cap as an infant so I was quite aware of what that was. Yet once I was introduced to the concept of seborrhea as explained above, “severe oiliness of the skin”, I didn’t come across this condition at all while working in the US. Then I moved back to Israel and I couldn’t believe how many people I encountered for facials that would tell me they had seborrhea. I was surprised to say the least. I couldn’t figure out how in one part of the world I had never come across this condition and in another part of the world I couldn’t seem to escape it. I wondered if the definition of this skin condition had changed from country to country, from language to language. The skincare companies that I worked with in the US never mentioned this condition to me or had products that treated it, unlike Israeli skincare companies that do both. Truthfully I am still trying to figure this one out, but in the meantime I realized that I better brush up on my knowledge about seborrhea. These lesions are usually found on areas of the body with more sebaceous glands, such as the forehead, eyebrows, around the nose and ears, scalp, midchest, and central trunk. It is characterized by greasy yellow scaling on erythematous patches of various thicknesses. It usually has no itching. It may be associated with rosacea. Dandruff is a mild form on the scalp. It is most common in infants (cradle cap) and elderly. It may also be flared by physical and emotional stress. Seborrheic dermatitis can look like psoriasis, eczema, or a skin allergy. A yeast (fungus) called Malassezia. This fungus is one of the normal microscopic life forms that grow, along with certain bacteria, in your skin’s oily secretion (sebum). Creams, foams or lotions containing an antifungal agent, such as ketoconazole (Ketozole, Extina), often help reduce flare-ups, supporting the idea that this yeast is a contributing factor. But seborrheic dermatitis itself isn’t considered an infection, and it’s not contagious. Change of season. Episodes are often worse in winter. Neurological conditions. Seborrheic dermatitis may occur more frequently in people who have Parkinson’s disease and certain other neurological disorders. Stress and fatigue. Stressful life events and situations may help trigger an episode or make it worse through mechanisms that aren’t yet understood. The role of neurological disorders and stress may be related through effects on the nervous system. HIV/AIDS. 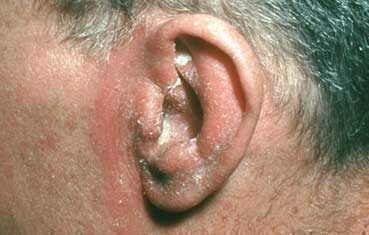 Seborrheic dermatitis may occur more commonly and tend to be more severe in those with HIV/AIDS. Seborrheic dermatitis doesn’t affect your overall health, but it can be uncomfortable and cause embarrassment when it develops on visible parts of your body. It isn’t contagious, and it’s not a sign of poor personal hygiene. Seborrheic dermatitis tends to recur, but you may be able to manage flare-ups by recognizing its signs and symptoms and by using a combination of self-care steps and over-the-counter (nonprescription) medications. First and foremost if you think that you are suffering from seborrheic dermatitis go see a dermatologist before trying to treat yourself. The doctor can determine if you need prescription products or not to keep your condition under control. Some skin conditions simply cannot be treated with over the counter products but with seborrheic dermatitis it depends on the severity of the condition. Seborrheic dermatitis tends to be chronic, and there’s usually no strategy that stops it permanently. But treatments — including many you can try at home — may control your signs and symptoms during a flare-up. The best approach for you depends on your skin type, the severity of your condition, and whether your symptoms affect your scalp or other areas of your body. Creams and lotions that you apply to affected body areas and medicated shampoos are all mainstays of treatment. In very severe cases, physicians may prescribe oral medications with whole-body effects. Products are available with several kinds of active ingredients. Some preparations include active ingredients from more than one category. The following over-the-counter treatments and self-care tips can help you control and manage seborrheic dermatitis. Wash your hair with a medicated anti-dandruff shampoo according to the recommended schedule. If you don’t see results, try a shampoo with a different active ingredient. Use an over-the-counter antifungal cream. Application of nonprescription-strength ketoconazole may be helpful. Apply an anti-itch cream or lotion to the affected area. A short course of a nonprescription hydrocortisone cream containing at least 1 percent hydrocortisone can temporarily relieve itching. Avoid harsh soaps and detergents. Be sure to rinse soap completely off your body and scalp. Wear smooth-textured cotton clothing. This will help keep air circulating around your skin and avoid irritation. Shave off your beard or mustache. Seborrheic dermatitis can be worse under mustaches and beards. If this is the case for you, shaving might ease your symptoms. Avoid scratching whenever possible. Scratching can increase irritation, making you more uncomfortable and increasing your risk of infection. Wash the skin daily with a soap that contains 2% zinc pyrithione. Wetting the skin thoroughly before washing. Applying a moisturizer after bathing. Applying a tar cream, letting it sit on the skin for several hours before rinsing. Applying a cream containing salicylic acid and sulfur. Do not use petroleum jelly to soften the scales. It tends to worsen seborrheic dermatitis. Bottom Line: In adults seborrheic dermatitis is a chronic condition without an actual cure. Proper home care coupled with prescription medications can help keep this skin condition under control. I really enjoy your Blog. This doesn’t really have anything to do with this post but what Israeli skincare line do you like the best? http://www.dermalosophy.co.il/ The products are really effective and give great results. I use them myself as well. What can we estheticians do for clients with this condition? Anything? Or simply avoid applying sensitizing products/ingreds? Hi, thanks for your question. Yes, first and foremost if we are giving a facial to someone who says they have seborrhea (or we see what looks like seborrhea) we should do a soothing facial and avoid using harsh/strong products in the area that has the seborrhea. I have found that people who announce to me that they have seborrhea either already have an over the counter cream or a cream from a doctor to treat that area of their skin. But you can definitely see what else they lack for proper home care and retail those products to them such as – a soothing/gentle cleanser, maybe a gentle toner, and if they don’t have one a cream that contains one of the ingredients mentioned in my post that help this condition. Lastly educating the client how to manage the condition is important too.